As schools let out for summer, now is the perfect time to schedule your family’s preventive dental appointments. As you navigate homework, after school activities, and daily life, the school year is a hectic time. As a result, dental care often gets placed on the back burner because there simply is not enough time. Now, you have more time in your day, creating the perfect opportunity to make your family’s dental health a top priority. 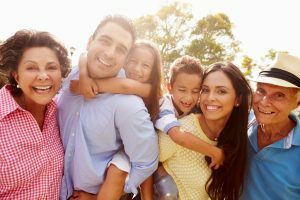 As your dentist in Long Island City, Dr. Ishwinder Saran offers the cleanings and checkups your family needs to maintain a healthy smile throughout summer and the school year ahead. The American Dental Association recommends that everyone over the age of two sees the dentist every six months for a cleaning and checkup. While brushing and flossing are important to preventing dental problems, regular appointments with the dentist are equally as vital. Even with the best home oral hygiene habits, there are still areas in the mouth a toothbrush and floss cannot reach. If these areas are not cleaned regularly by the dentist, it increases your risk for tooth decay and gum disease. During a hygiene appointment, the hygienist will use special dental tools to clean below the gum line and in between the teeth to remove plaque and tartar accumulations. In addition, our dental team will make recommendations to improve your oral hygiene to better protect your dental health. After the teeth are cleaned, a comprehensive checkup is performed. This allows us to monitor your dental health to prevent the development of common dental issues, like tooth decay. In addition to a visual examination, we will use x-rays and diagnostic images to gain a deeper insight into your dental health. By doing so, this allows us to predict potential dental issues that may arise in the future, such as overcrowding, to provide the necessary interventions. This helps to keep the teeth and gums healthy while reducing the need for costly and invasive dental treatments in the future. Upon completing your checkup, we will make certain recommendations to further protect your oral health, such as fluoride treatments. This is a simple treatment that is used to strengthen the enamel to ward off tooth decay. We often recommend dental sealants for young children to help reduce cavity development in hard-to-clean places like the back molars. After performing the examination, we will discuss our findings, such as if a treatment is needed. We will answer your questions and create a plan that caters to your individual needs to help you reach your oral health goals. As you begin planning your summer vacations, do not forget to take the time to schedule your family’s preventive dental appointments. As a family and pediatric dentist in Long Island City, Dr. Saran offers complete dental care to patients of all ages. He will help you and your family enjoy the summer months with healthy, beautiful smiles. Contact our office today to schedule your preventive dental appointment.